Locomotives: Powered railway vehicles used to pull rolling stock. 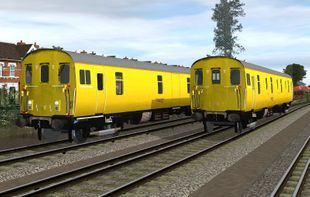 Rolling Stock: Locomotive hauled Carriages and Wagons. 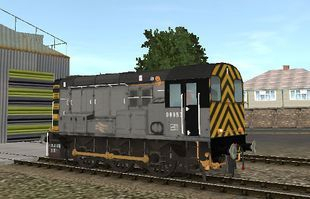 Description: Class 08 in BR Civil Engineers Grey Livery; this livery was used on a number of 08s that were employed by the BR Civil Engineering department; applied progressively in the late 80s, this livery lasted well into the privatisation era. 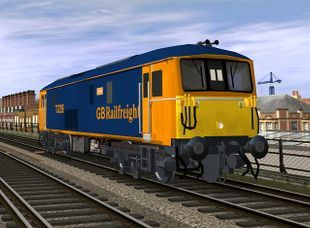 Description: FGW were looking for a replacement for their class 47 fleet and so in 2000 Porterbrook placed an order with Brush, 57601 spent its time hauling express and motorail services from Paddington to Plymouth and Penzance as well as the Night Riviera Sleeper train. Following the evaluation period in 2003 FGW decided to order 4 more 57/6s. 57601 was returned to Porterbrook, shortly afterwards it was sold to West Coast Railways where the loco has remained ever since. 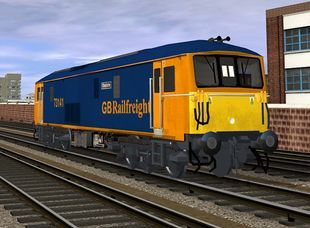 Description: From September 2011 to July 2014, Network Rail leased six Class 57/3s from Porterbrook to be based on the Southern Region, although they did regularly stray further North. They were used mostly for the Snow Train and on Network rail test trains. 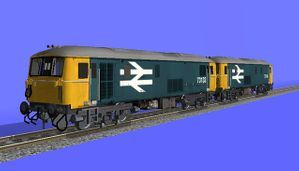 They could also act as Thunderbird locos if required as the couplings were configured to operate with Classes 171, 350, 375, 376, 377, 444 and 450. 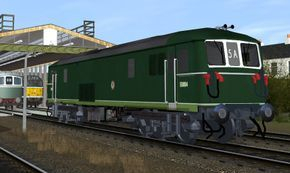 Description: The BR Green livery was applied only to the six prototype Class 73s introduced in 1962, most were painted in typical BR Green, with a lighter green around the solebar without yellow warning panels, except for E6001, which was painted in Southern Region coaching stock green with yellow front ends. They carried the livery in this form until around 1967 when yellow front ends were added, although this livery was to only last two years when the prototype Class 73s were repainted into BR Blue in 1969. 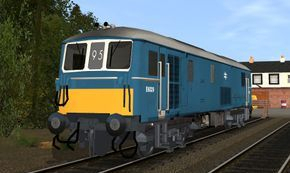 Description: The BR Electric Blue livery was applied to the entire production fleet of 43 Class 73s upon introduction from 1965 to 1967, although the first four had a grey band at solebar level. Between 1969 to 1973, BR Electric Blue was progressively replaced by the more standard corporate shade of blue. 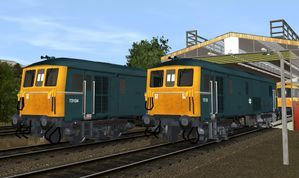 Description: Depicted in the ubiquitous BR Blue with Pre TOPs numbers, this livery in it's form depicted here lasted from 1969 until 1973 when TOPs numbers were applied. 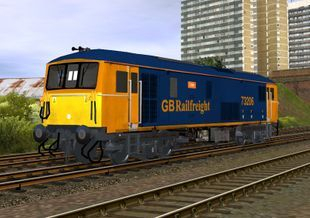 Description: Depicted in the ubiquitous BR Blue with TOPs numbers, this livery in it's form depicted here lasted from 1973 through to the mid 80s. 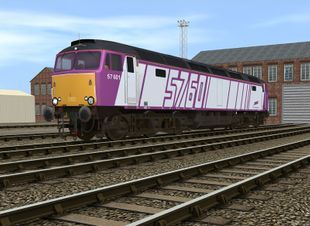 Description: The Large logo livery arguably suited the profile of the Class 73s well. It was first applied in the early 80s and lasted until the early 90s when sectorisation liveries were applied. 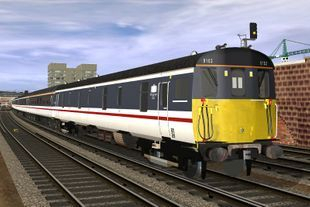 Description: The Intercity livery first appeared on the Class 73s in 1985 when a number were repainted for the recently launched Gatwick Express service. 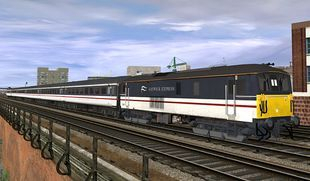 Many members of the class were repainted in this colour scheme and could be seen not only on the Gatwick Express services but also on passenger, freight and engineers trains too. 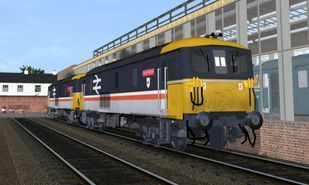 Description: The Class 73s are depicted in their post privatisation Gatwick Express livery, check the Rolling Stock section for the rest of the rolling stock that runs with these locos. 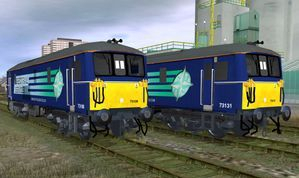 Description: 73141 was acquired from Network Rail in 2009 and was subsequently repainted into First GBRF Livery and given the name Charlotte, in 2014 it was repainted from First GBRF livery into Europorte GBRF livery, the model depicts it in it's current livery. Description: 73206 was one of the original six Gatwick Express locomotives purchased by GBRF in 2005, it was named 'Lisa' and then painted into GBRF livery. 73206 was converted into 73963 in 2014, as part of the ongoing Class 73-re-engineering project. Description: 73209 was one of the original six Gatwick Express locomotives purchased by GBRF in 2005, it was named 'Alison' and then painted into GBRF livery. 73209 was converted into 73961 in 2014, as part of the ongoing Class 73-re-engineering project. 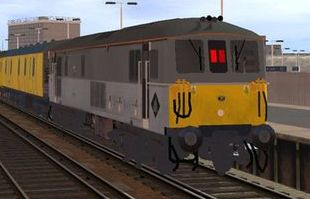 Description: GBRF Two Tone Grey 73107: RT Rail acquired 73107 from the defunct Fragonset railways in 2007, it subsequently repainted the loco into Two Tone Grey but it still retained it's Spitfire nameplates. In 2010, GBRF purchased the loco from RT Rail and reinstated it's earlier 'Redhill' nameplates, but kept it in two tone grey (This is the condition my model is in). 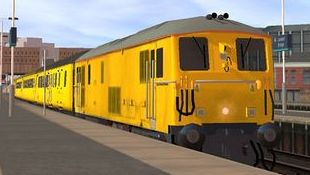 Then in September 2015, GBRF repainted the loco into GBRF colours. It can often be seen operating Network Rail test trains with 73138. Description: 73138 in Network Rail livery, it's currently the only un-re engineered Class 73 owned by Network Rail at present. It has track inspection cameras on its B end and can often be seen operating Network Rail Test trains with 73107. 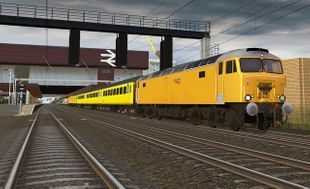 Description: Although it's a fictional livery, I didn't think it would implausible for DRS to have some 73s for operating trains to Dungeness Nuclear Power Station, Sheerness Steel works trains, and various infrastructure and Thunderbird duties around the SouthEast. 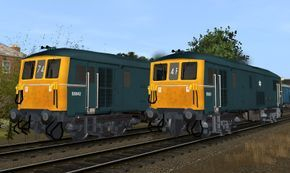 Description: Network Rail liveried Class 489s in both original and refurbished condition, Network Rail bought 3 Class 489s off Gatwick Express for use on Deicing and Loadbank testing duties. Teo of these units are still in service. These are often seen coupled up to a GBRF Class 73.